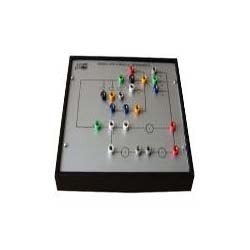 Our gamut of Network Circuits Electrical Engineering Trainer have gained tremendous accolades for consistently maintaining the quality standard for which it’s widely used in many industries. We also hold the capability to custom make our range as per the specifications detailed by the clients. 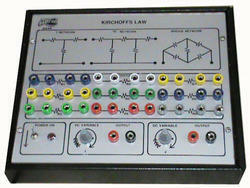 We are counted as one of the leading manufacturers and suppliers of Kirchoffs Law Apparatus. 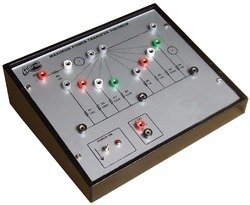 Designed in accordance to the needs of our patrons, the offered apparatus is ideal for understanding the principle & verification of kirchoff’s law. In addition to this, the offered kirchoff's law apparatus is rendered by us at cost effective prices. 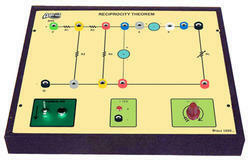 Demonstrates the principle & verification of kirchoff’s law: i. Current law. ii. Voltage law. Facility for connecting external power supply. Built-in resistor bank for building various combinations. Multi-coloured test points are provided in the circuit to observe voltages. 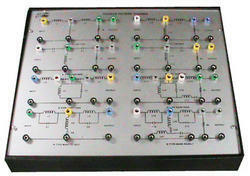 Housed in an elegant metal cabinet with a well spread intelligently designed circuit layout on front panel. ¢ Completely self contained stand - alone unit. ¢ Facility for connecting external Power Supply. ¢ Built - in Resistor bank for building various combinations. ¢ Set of required number of patch cords. ¢ Multi - coloured test points are provided in the circuit to observe voltages. 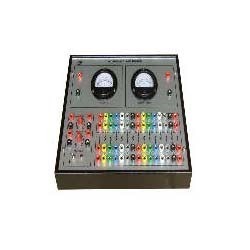 ¢ Housed in an elegant metal cabinet with a well spread intelligently designed circuit layout on front panel. ¢ Strongly supported by a comprehensive instruction manual complete with theory and operating details. 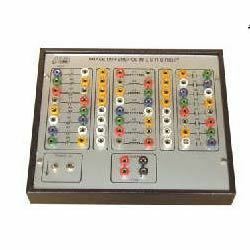 ¢ Built - in DC regulated power supply with short circuit protection & LED indication for supply “ON” to work on 230V AC Mains. ??? Completely self contained stand - alone unit. ??? Facility for connecting external Power Supply. ??? Built - in Resistor bank for building various combinations. ??? Set of required number of patch cords. ??? Multi - coloured test points are provided in the circuit to observe voltages. ??? 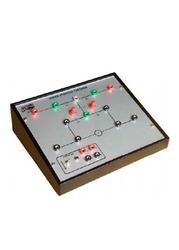 Housed in an elegant metal cabinet with a well spread intelligently designed circuit layout on front panel. ??? Strongly supported by a comprehensive instruction manual complete with theory and operating details. ??? Built - in DC regulated power supply with short circuit protection & LED indication for supply “ON” to work on 230V AC Mains. Completely self contained stand - alone unit. Built - in Resistor bank for building various combinations. Multi - coloured test points are provided in the circuit to observe voltages. Built - in DC regulated power supply with short circuit protection & LED indication for supply “ON” to work on 230V AC Mains. Multi - coloured test points are provided in the circuit to observe voltages. ??? 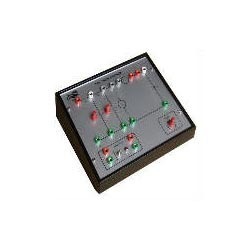 Housed in an elegant metal cabinet with a well spread intelligently designed circuit layout on front panel. Built - in bank of resistors capacitors and coils. Various combinations of RLC in series possible. NO POWER SUPPLY IS REQUIRED SINCE ONLY PASSIVE COMPONENTS ARE USED. Various combinations of RLC in series and parallel possible. 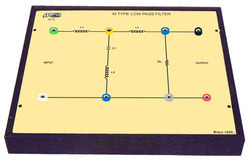 Dedicated trainer board for each filter circuit. Demonstrates the principle & working of a passive constant k - type low pass filter circuit. 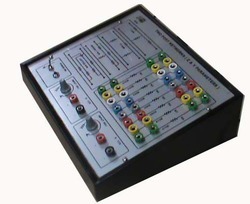 Multi - coloured test points to connect & observe the voltages & waveforms. 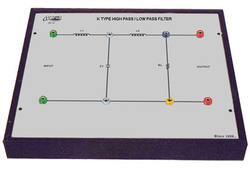 Demonstrates the principle & working of a passive constant K - type high pass filter circuit. Study the attenuation & phase characteristics of the filter circuit. Demonstrates the principle & working of a passive constant K - type band pass filter circuit. Demonstrates the principle & working of a passive constant K - type band reject filter circuit. Demonstrates the principle & working of a passive constant M - type low pass filter circuit. 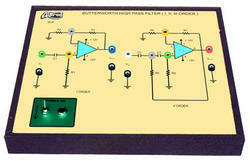 Demonstrates the principle & working of a passive constant M - type high pass filter circuit. Demonstrates the principle & working of a passive constant M - type band pass filter circuit. Demonstrates the principle & working of a passive constant M - type reject filter circuit. Demonstrates the principle & working of various passive filters. Study the attenuation & phase characteristics of each filter circuit. Multicoloured test points to connect & observe the voltage & waveforms. Strongly supported by a comprehensive manual complete with theory and operation details. 1. Constant K type low pass filter. 2. Constant K type high pass filter. 3. 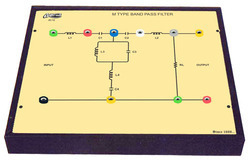 Constant K type band pass filter. 4. Constant K type band reject filter. 5. Constant M type low pass filter. 6. Constant M type high pass filter. 7. Constant M type band pass filter. 8. Constant M type band reject filter. Complete self contained stand - alone unit. Demonstrates the principle and working of attenuators. Built - in ic based dc regulated power supply, variable, with short circuit protection and led indication for supply “on”. 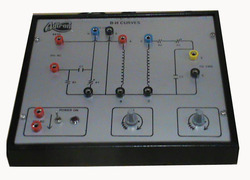 Facility for connecting external ac variable voltage through function generator. Built - in resistive loads. Built - in resistive attenuators for t, , bridge t and lattice networks. 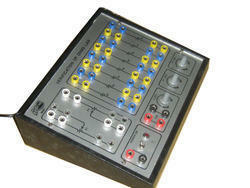 Multi - coloured test points are provided at various stages in the circuit to observe the waveforms and voltages. Housed in an elegant cabinet with a well spread intelligently designed circuit layout on front panel. 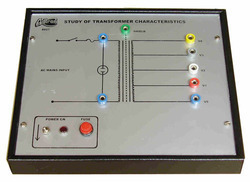 Study the characteristics of a transformer. Directly mains operated with neon indication for supply “ON” and fuse protection. Built - in multi tapped steps down transformer with shield. Study and determination of voltage ratio and turns ratio between primary and secondary. Study and determination of regulation and efficiency of the transformer. Demonstrates the principle and working of a Twin parallel conducts. The 1mtr Transmission line encited by an in built 300 - 400 MHz source. i. To find out frequency of oscillator.ii. To find out value of characteristics impedance. A detector unit with sensitivity pot is provided to observe the maximum and minimum along the line. Set of coils with E laminations provided. Output to be connected to the oscilloscope. Multi - coloured test points are provided in the circuit to observe voltages and waveform. Set of required number of patch cord. 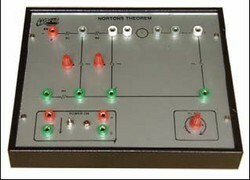 We are engaged in offering the premium quality of Thevenins Theorem Apparatus to our esteemed patrons. To attain maximum customer approval, the offered Thevenins Theorem apparatus is available with us in various user-defined specifications. Its electrical & thermal stability, make this apparatus highly demanded. .
With the aid of latest machinery and skilled workforce, we have been able to offer the finest quality of Theorems & Laws Trainer Kit. Due to its high performance and low maintenance, the offered trainer kit is highly demanded. By using advanced machinery, the offered theorems & laws trainer kit is precisely fabricated as per the industry laid norms. 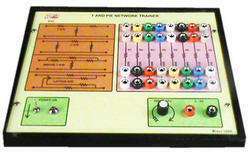 We offer our patrons with the best quality of Series & Parallel Resonance Trainer. 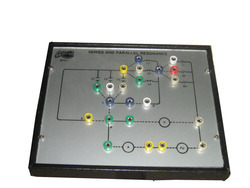 For study of series and parallel resonance in LCR circuits, the offered series & parallel trainer is used. Our patrons can avail the offered series and parallel resonance trainer in bulk quantities, owing to our large production capacity and spacious warehousing unit. Built-in a block of resistors, 8 inductors and 8 capacitors of assorted values. More then 10 experiments possible. Experiments such as ohms law, rc circuits like low pass & high pass, RL circuits like low pass and high pass, kirchoff’s law’s, etc. Looking for Network Circuits Electrical Engineering Trainers ?